450 people in our community are currently praying with you. and bread eaten in secret is pleasant." Now Peter and John went up together to the temple at the hour of prayer, the ninth hour. And a certain man lame from his mother�s womb was carried, whom they laid daily at the gate of the temple which is called Beautiful, to ask alms from those who entered the temple; who, seeing Peter and John about to go into the temple, asked for alms. And he took him by the right hand and lifted him up, and immediately his feet and ankle bones received strength. So he, leaping up, stood and walked and entered the temple with them�walking, leaping, and praising God. And all the people saw him walking and praising God. Then they knew that it was he who sat begging alms at the Beautiful Gate of the temple; and they were filled with wonder and amazement at what had happened to him. Christ has gone. We expect that his power of working miracles, as signs that he was sent by God, would have gone with him. Yet here were have Peter healing a lame man, just as Christ would have done. The Gospels, especially John's Gospel, show us that these miracles have a specific purpose. They are not cheap tricks, but rather, signs to those who see them that the healer has a special status, given by God. Peter also tells the man to get up and walk "in the name of Jesus Christ of Nazareth". Remember, in John 11:43, Jesus simply used the words, "Lazarus, come out!" Thus, Peter is not pretending to heal by his own abilities, or even by dispensation from God the Father. His healing is a sign that, although Christ is gone, the Holy Spirit remains, just as Christ had promised. 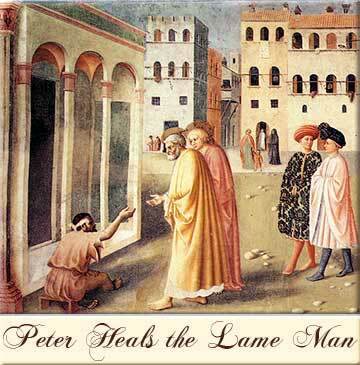 To ease the transition from Christ's physical presence on earth, Peter can heal by Christ's authority. He has not been left completely alone, as Jesus had promised he would not be. It is fundamental to our faith as Christians that Christ did not leave us alone. He is still with us; he dwells within us, when we are baptized, in the form of the Holy Spirit. Today, we do not necessarily see the kind of dramatic healing that characterized the period after Christ's ascension; that seemed mostly to form a transitional period, to cushion the shock of Christ's departure to those who had depended on his physical presence. Christ did not want the church to die from the trauma of his departure. So, like Christ's miracles, Peter's miracle is not a magic trick designed to lure in a few witnesses. It is, rather, a sign that Christ's power has not departed with him. Fittingly, this power is displayed through the apostle whom Christ had named the rock upon which he would build his church.